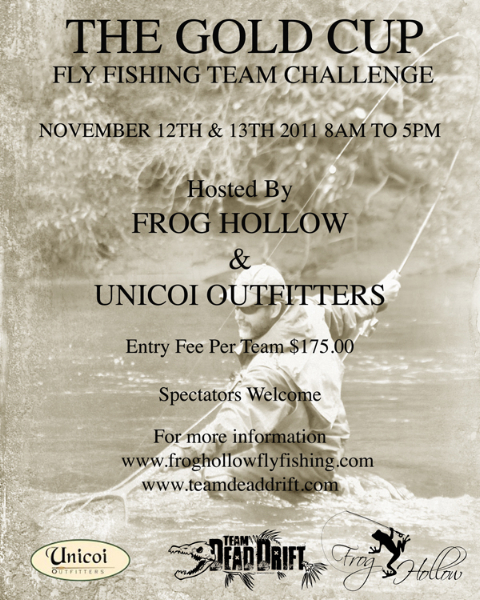 Team Dead Drift, Frog Hollow and Unicoi Outfitters are pleased to announce the 3rd annual “Gold Cup Fly Fishing Team Challenge”. You are invited to attend or to participate in this two-day fly-fishing event to be held at Frog Hollow on the beautiful and picturesque waters of the Chestatee River in Dahlonega Georgia and Unicoi Outfitters the famous and beautiful Chattahoochee River south of Helen, Georgia. Saturday November 12th 2011 8:00a.m. - 5:30p.m. Sunday November 13th 2011 8:00a.m. - 5:30p.m. To view this event is free and open to the public. The Gold Cup Team Challenge is an annual two-day event, which will permit a two-person team to match their skills against other teams, to earn a $1,000 grand prize, plus, one full day fishing and one night lodging at Frog Hollow. Team awards will be given for 2nd, and 3rd place. Best Angler award will be given for the most total points by one angler. Registration to compete is open to the general public, on a first come basis. A maximum of 20 teams will be permitted; a minimum of 10, two-angler teams must be registered for the event to take place. A non-refundable registration and entry fee for each team is required. In the event an insufficient number of participants register for this event, all funds for individuals will be returned. A 6:00 p.m. kick-off dinner will be hosted at Frog Hollow on the Friday evening before the Challenge. A portion of the proceeds from this event will go to Gold Rush Chapter Trout Unlimited, a 501 (C)(3), non-profit organization. Volunteers, sponsorship, exhibitors, donations and prizes welcome. The goal of the Gold Cup Challenge Committee was to coordinate an event with a prestigious fly fishing award with the benefits and intent to promote, educate and inform the public about the joy of fly-fishing. The Georgia Fly Fishing Team is a group of anglers who compete in local and national fly fishing tournaments. The team is excited as it makes strides to collectively participate and encourage in the sport of competitive fly-fishing. Those interested to follow the progress of the team as we make steps toward our goals, please feel free to follow and support us! Team Dead Drift is dedicated to developing a competitive fly-fishing team to participate in regional, national, and international events. The Team will strive to assist in educational efforts aimed at teaching the art of fly fishing. It will also endeavor to participate in conservation efforts (in coordination with other organizations) to protect and preserve the diverse cold water and warm water fisheries throughout the state of Georgia and the southeast. I can't seem to locate the rules on any of the sites mentioned. Could you be more specific?